Born on a farm in Centerville, Ohio, in 1934, where he turned 14, “Red” moved to Tucson with his family where he completed his education and began his business career. Working after school at Miller Rasor Radio and Speedometer, Red became acquainted with fellow employees Hank Arnold and Roger McCluskey, two local circle-track heroes. They introduced Red to the world of high performance automobiles. In time, Red began to work as a crew member for McCluskey and Bill Cheesbourg went on to race at the Indianapolis 500 seven-times, and McCluskey raced 17-times. 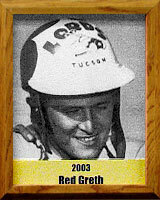 At 16, Red began competing in organized drag races in the Phoenix arena since Tucson did not have a facility. He did, however, participate in street racing held at the Mount Lemmon “cut off” a straight stretch northeast of Tucson which included a built “start” and “finish” line between two cattle guards. Eventually Red began building and driving winning “drag” cars while in high school and joined the best known car club in town, the Lords of Tucson, and raced in a variety of cars from dragsters to roadsters to funny cars. He became a member of the famed “Speed Sport” Racing Team, where he developed a roadster that in 1957, Red drove 169.11 MPH, a speed unequalled by any drag machine to that date. In 1994, that Speed Sport Team, and the car, were inducted into the International Drag Racing Hall of Fame. That car still runs today and Red still drives it at special events.